In the interests of full disclosure: I work with Shawn T. Collins and I’m a friend of his. He let me know about his book Letters to My Unborn Children, so I asked to borrow a copy and read it. I’m Catholic and we treat all human life as sacred, starting at conception. Shawn is not Catholic, but we certainly share this widely-held Christian belief. That said, it seems a travesty that we don’t really talk about miscarriages in either my faith or in Shawn’s. I’ve found that there are some Catholic books on the topic and that the Catechism of the Catholic Church covers the topic, but when have I heard this topic discussed? When do we hear about this in the secular world? I was amazed to find out how common miscarriages are. Reading Shawn’s book alerted me to the fact that there are a lot of people around silently mourning the death of a family member that they never had the chance to meet. Shawn refers to parenthood as an “extreme sport” and I never realized how true that really is. There’s a risk that a topic that isn’t brought into the open will be ignored, leading to an hidden but open wound and the source of a spreading infection. Grief can’t be ignored and it’s an important part of the healing process. In this book Shawn brings his family’s grieving out into the open and deals with it using his faith, a loving relationship with his family, and the act of writing letters to the three children that didn’t survive to be born. By no means does this solve the pain and make it go away for him or for anybody. By reading this book, however, we can get a renewed sense of the value of human life and a greater appreciation for the families that we have. I heartily endorse this book for somebody who is going through the grief of miscarriage, and also for anybody who wants to gain further insight into just how precious human life is. I watch streaming videos on Netflix and Amazon Prime while I use my rowing machine. It’s not the most optimal way to watch a movie, but it sure makes the time spent exercising more fun. I watched an interesting movie on Amazon Prime this morning called 2047 Virtual Revolution. The look of this movie was good and the graphics were very well done. However, nobody can escape that the atmosphere, scenery, buildings, flying cars, clothing, and even the handguns were all heavily inspired by Bladerunner. 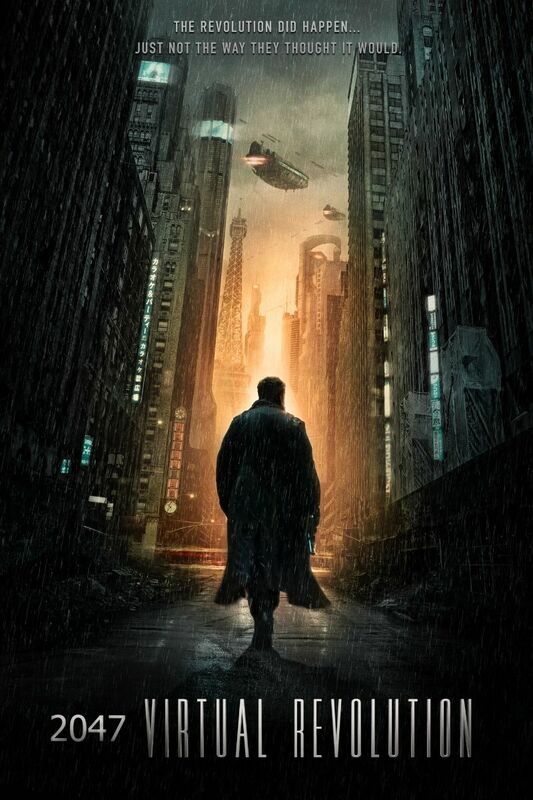 The creators of this movie are obviously Bladerunner fans, but they should do more to differentiate themselves. One thing was different, visually: the sun was actually emerging to light up the sky at the end of the movie. Graphics are one thing, however the plot is more interesting and led me to write down my thoughts. There is some thematic overlap with The Matrix, but only at a high level. The Matrix used a virtual world as a political allegory representing how lies are used to control people and their behaviors in the real world. In 2047 Virtual Revolution, there are elements that seek to control and take advantage of human nature, but the virtual worlds aren’t used as allegory at all. They are exactly what they appear to be: an addiction and an escape from an ugly world that is probably made much uglier because nobody is *present* to make it a better place. While the revolutionaries in this movie believe that everybody wants to be liberated, people prove that they’d rather be parasites to the State and corporations, escaping to live their lives in a virtual world. True liberty allows people to make their own decisions, and one character in this movie observes that nobody forced the majority of the population to become “the connected.” I think there’s a lot of truth in this. Movements for liberty often forget that the majority of people are happy to be mindless, sheep-like consumers. People will sometimes choose addictions and self-destruction over existing in a real world where they can create, assist, and participate with humanity in seeking higher purposes. Forcing people out of their ‘verses wouldn’t have fixed this. Just thought I should share these thoughts today. On my major effort to fix the imfamous OM642 oil cooler leak, I managed to mess up the diesel return line. Now that I know how the connectors work on these, I figured I should make a quick video to share what I’ve learned. Enjoy! Sometimes we let life get too complicated: It’s time to prioritize and simplify! I really want to do more on this channel and eventually I’m going to do that. In the short-term I’m super busy! I have a demanding day-job. I manage a Zero Defects program at a major turbine engine manufacturer in Indianapolis. I’m an engaged home school dad, which includes involvement in a home school speech and debate league. I actually spent this weekend performing orientation for guest debate judges. My youngest child will graduate this May, and I’m up to my neck trying to get my neglected house, workshop, and grounds into a condition where they are presentable for the open house. This means I’m at the end of the home schooling process, though, meaning I’ll have more time later. It’s the primary source of the material on this site, but I work hard keeping my family’s vehicles on the road. I’ve saved up quite a bit of material saved up that I could turn into videos and blog posts. I’m also exploring cryptocurrencies and making some speculative bets. For a while I explored eCommerce related to The Art of Diesel, even setting up a store, but this effort really failed because my heart really isn’t into selling worthless Chinese trinkets at a high markup. I’ve also started Ethical Developer Group and I’ve failed to stay on top of that site, either. I’m a crazy person who wants to do everything, because there are so many cool things that get my attention. In the short-term, I’m going to shift my priorities to Ethical Developer Group, and I’d like every user of this site to go over there and check it out. I will occasionally make some quick posts over here, but I’m really going to concentrate my blogging and business development over there. Exciting things are happening, in that EDG actually has a paying client with ethics very similar to our own. We can’t share any details on this right now, but this will be a really useful Android app for a very inexpensive but useful service. I’m also exploring blockchain technology and see some opportunities that should really be explored in that space. I will keep working on cars and eventually I will get back to sharing my efforts and what I’ve learned, but EDG is where I’ll be putting my attention for the next few months. Before I get to Elon Musk and SpaceX, let me give a quick update. It’s been a long journey, but my son’s Audi is almost back on the road. It’s together and it doesn’t leak, but it still has a performance issue. After whipping out my VAG-COM and doing some data logging, the things I can measure look OK. It seems to provide really good performance at random, but especially when little demand has been made of it for a few seconds. I think the fuel filter is plugged. “Cheap” Audis? Don’t let anybody tell you that an old Audi is cheap! That said, the car is shaping up to be a lot of fun to drive, once everything is sorted out, and we might actually buy another for my daughter. AWD is a really nice thing to have and these cars are actually quite cheap to insure. I have an MS is in Astronautical Engineering and I’m a genuine space guy at heart. I’m also big on entrepreneurial ventures, so I have to say that the SpaceX Heavy launch recently was really cool, including that they brought two of the boosters back for a soft touch down side-by-side. I’m not a huge Elon Musk fanboy. All the heavy subsidies on Teslas make him look more like a crony than a real entrepreneur. However, I must admit that he’s still doing some cool things. The Falcon Heavy Launch featured an unusual payload. SpaceX put a Tesla Roadster in orbit. Here’s a live feed of it. An obvious reference to science fiction (or at least sci fi parody) is found in the “Don’t Panic!” displayed on the dash. However, a more obscure reference is found in the whole concept of an astronaut driving a convertible in Earth’s orbit. The opening sequence of Heavy Metal, a rather …um… adult, R-rated rock-n-roll sci fi cartoon from 1981 featured a similar theme in their opening sequence. Have you ever imagined reentry in an early model Corvette convertible?! Set to some fun rock ‘n roll music, this opening sequence had my friends and I rolling around laughing back in he 80s. I thought I’d just share this because it’s fun! 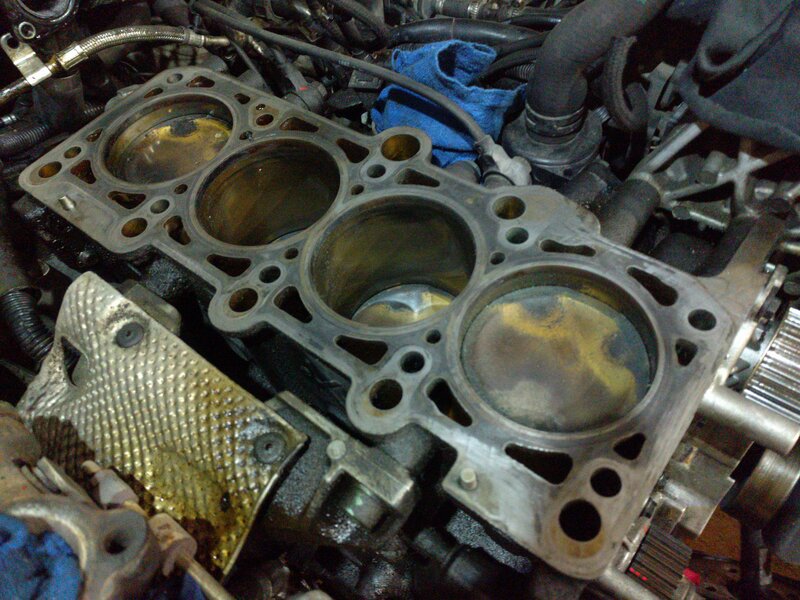 My son’s 2002 Audi A4 Quattro started dumping about a quart of oil daily, so we dug in and found out that the head gasket was leaking. Compression is still good, but the head needed to come off! This “cheap” Audi isn’t so cheap, anymore! The old 2001 MkIV Jetta TDI is having glow plug circuit issues and we can pretty much forget about driving it in subzero weather until I can troubleshoot that system. My son was driving my 2005 B5.5 Passat TDI and wound up getting it jump-started one subzero morning. I had to replace that battery. I found out the old one had been in there since 2012 (before I owned it)! Now I have a new oil slick on the floor where I’ve been parking the 2007 Mercedes R320 CDI. It’s just left of the centerline and toward the rear of the engine…so I need to dig into it and replace the dreaded OM642 oil cooler seal! I’ve pulled the head from the engine. The photos that follow simply document the process I’ve made this weekend. Today I’ll clean up the valve cover and intake manifold to paint them up and make them pretty. When my Amazon Prime valve spring compressor tool shows up in two days I’ll replace the valve stem seals. 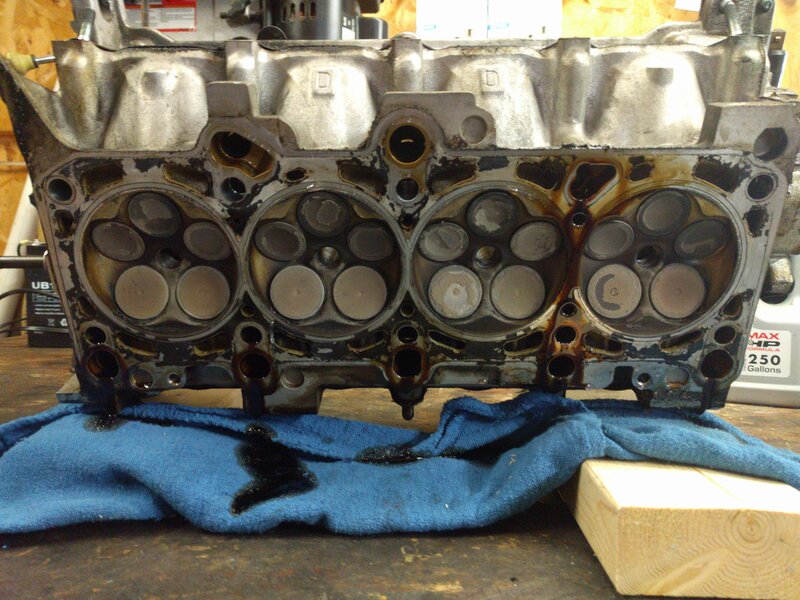 I’ve removed the head from the 1.8T, and you can see the top of the engine block. I’ve checked the deck surface with a good straightedge and a flashlight. No light was leaking under the straightedge anywhere. The deck looks perfect! I’ll just clean it up good before I get it all back together. Check out the 1.8T’s head. These engines are very common. They are found in a lot of VW and Audi vehicles. They are surprisingly exotic, with five valves per cylinder! That explains how it spools so smoothly. That’s also why there’s so much horsepower potential in these little engines. 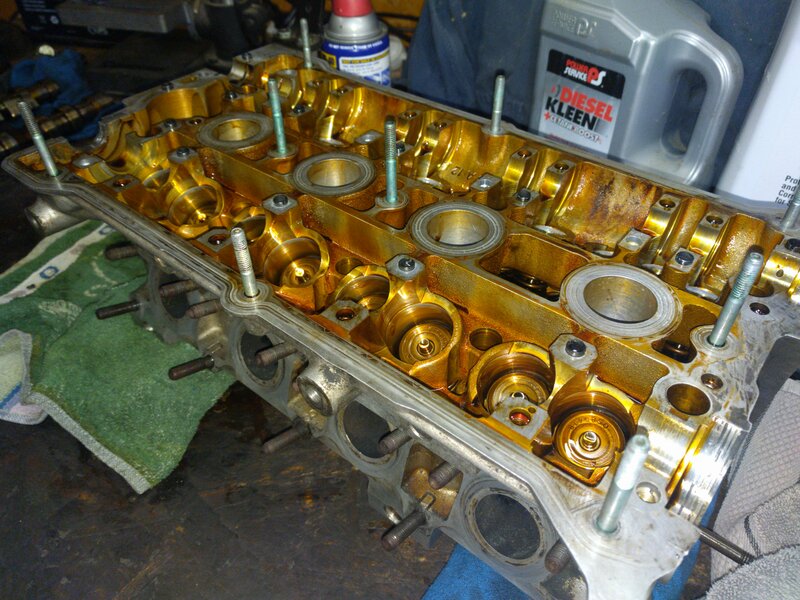 I pulled the camshafts to check on things and replace the valve stem seals. Might as well, while I have the head off. 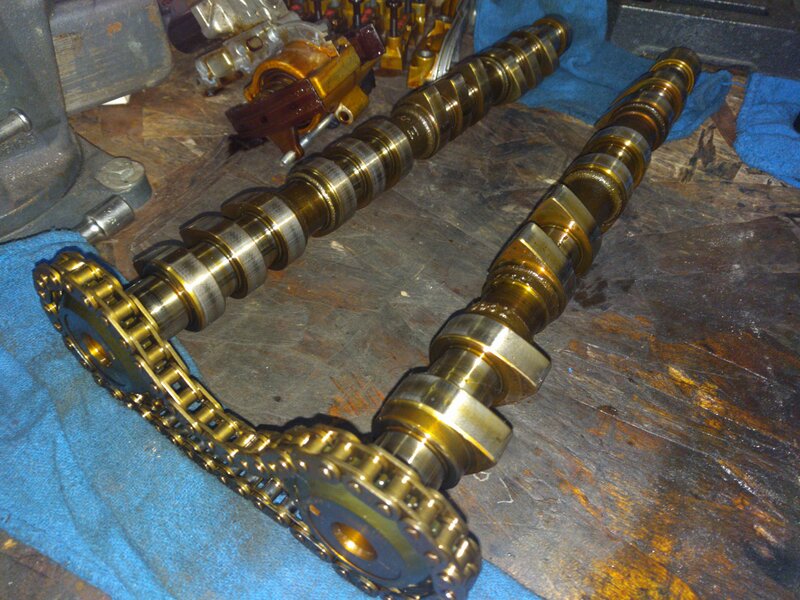 The tensioner is in the background in this photo. Be sure you buy a tensioner compressor before attempting this job! It would be very difficult without this tool. 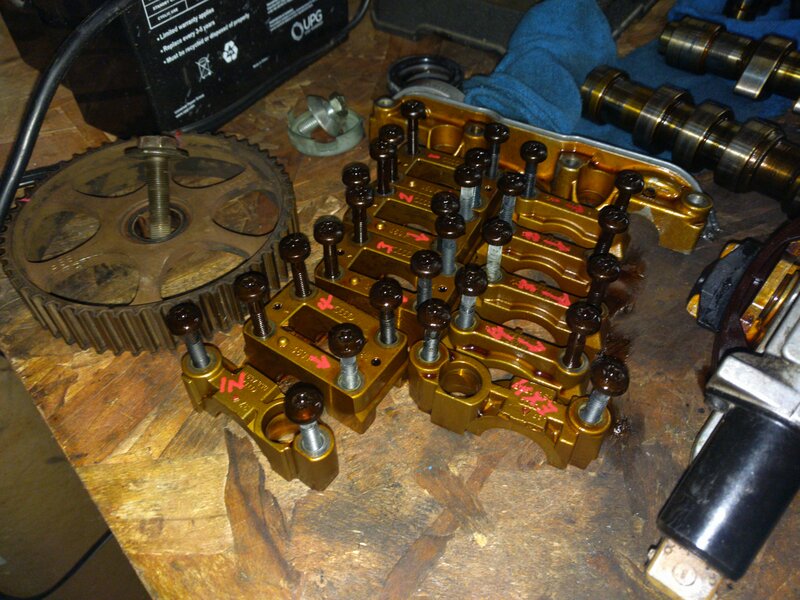 The Audi 1.8T’s bearing journals are lined up here. Note that they’ve all been marked so that they go back into their proper locations. Here is the head with the cams removed. The valves are buried deep down in this head, so I’ve ordered a better valve spring compressor tool. I cleaned up the mating surface on the head, checking it with a straightedge and a flashlight. When I do this I put the flashlight behind the straightedge and look to see if light leaks through anywhere, indicating warpage. I didn’t find any on the head or the engine block’s deck. So, I’m not sure why the head gasket started leaking oil. I suppose being 15 years old and having 180,000+ miles might have something to do with it. Perhaps the head bolts should have been retorqued at some point. I’m counting our blessings that we don’t have to go to the machine shop on this effort! At this point, you’ve probably noticed that everything in this engine has a brownish color from varnish that has built up. I’m not going to go to crazy cleaning a high mileage engine on a “cheap” car, but it’s apparent that previous owners weren’t using synthetics and/or didn’t change the oil often enough. Well, thankfully the compression is still very good, so we’ll just keep some good synthetic oil in there (we use LiquiMoly in our VW and Audi vehicles) and it will probably clean itself up over time. I’ll provide more updates as I work through this effort and the others that are on my TO DO list. Happy New Year! Free E-book! Click on this image to get The Art of Diesel on Amazon! Available in e-book or paperback. To celebrate the new year, we are doing a promotion for our diesel swap book The Art of Diesel: Building an Efficient Family Hauler. Go to Amazon now and get the e-book for free this Monday and Tuesday, the 1st and 2nd of January 2018. The paperback version is also available at its normal price. This effort stemmed from my dissatisfaction with what the market was offering for large vehicles with reasonable efficiency. I chose to build an efficient vehicle of my own. I created a diesel-powered Suburban with an EMP-proof drivetrain that delivered 26 mpg on the highway. The vehicle retained four wheel drive and air conditioning, making it a practical family hauler. I gleaned a lot of information from web forums. Finding useful information this way is slow and painful, though. I wished for a comprehensive book on a diesel conversion, but couldn’t find any. So, I wrote one to help others with their conversion projects. People universally underestimate the complexity of diesel conversion. So, my book examines each subsystem that needs to be modified and discusses the decisions I made. This book helps anybody considering a diesel conversion by covering the full scope of the undertaking. I no longer own the Suburban. A rod bearing failed at a time when I was buried in my day job. I sold it to somebody who is fixing it, and I hope to report back on it later. In my blog at The Art of Diesel, I continue to work on my fleet of diesels and I will eventually get back to other conversions. Order your free e-book today! Is Mercedes-Benz maintenance a scary topic? It shouldn’t be! Apparently, the air filters on the OM642 in my Mercedes-Benz R320 CDI had never been replaced. This is especially bad when you consider that this vehicle has over 150,000 miles on it! 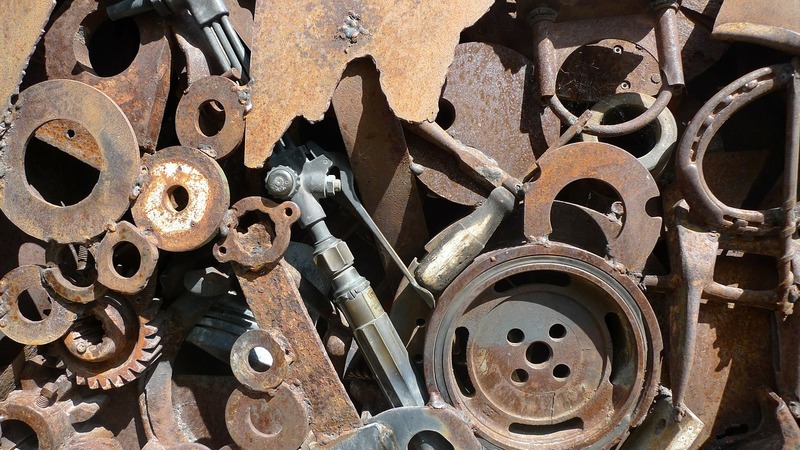 It doesn’t matter how well a machine is engineered, maintenance is required! 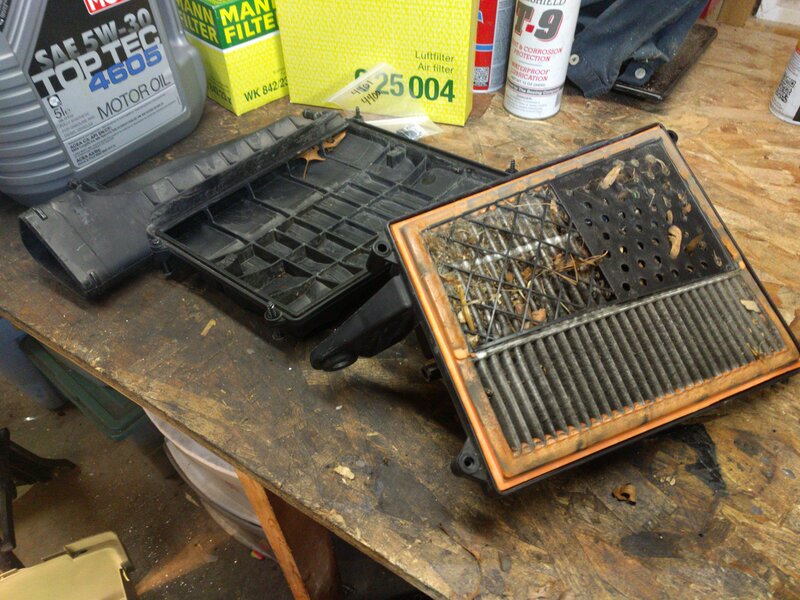 The air filter positions on the sides of the engine probably scared the previous owners from even trying. Ugh! Try not to vomit when you see this! The left side wan’t any better! 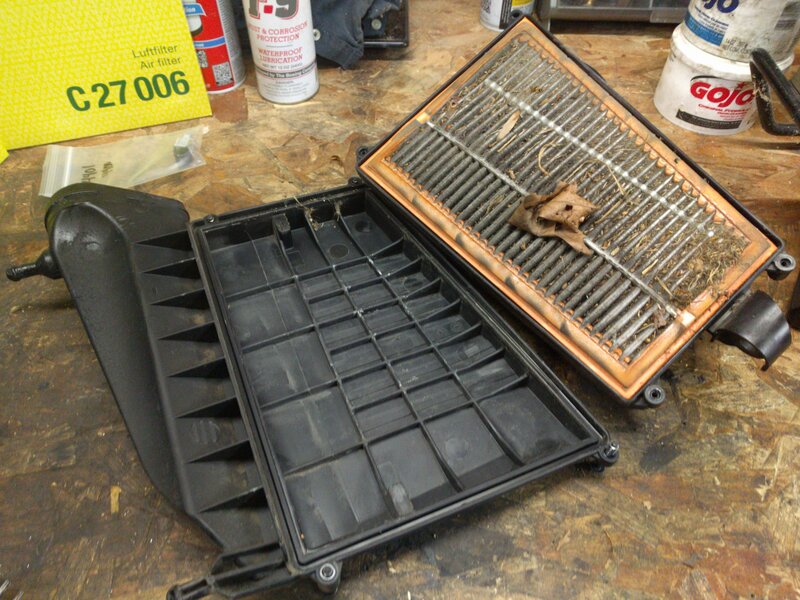 These air filters were in worse shape than any I’ve ever seen. They were so filled with junk that the areas between the pleats were actually filled in! In the video below, I start the Don’t Fear the Mercedes series, showing how to access and remove the housings for filter replacement. Please LIKE this video on YouTube and subscribe to our channel! Please also join my email list to receive updates. May the Lord bless you and keep you running on all cylinders! The last few days have been a bit crazy with visiting extended family, but we managed to have a great Christmas in Ohio and Indiana. We got to a lightly-attended Mass on Christmas morning and made our way back to Indiana in the afternoon. We exchanged gifts with my in-laws and lots of nice things were shared. However, I wanted to share the extra special gift my daughter gave me. I thought that perhaps she bought this mug with the printing on it, but she took the time to carefully paint the mug by hand. This is an indication of the things that we value most in life. We accept that many very complex things in our lives are the product of mass production, but we truly place the most value on things that involve human labor and thought. This is exactly why we do the things we do for our families and why Catholicism values subsidiarity and distributism so much. These things aren’t about redistribution of wealth by government entities, but about handling life’s challenges at the lowest possible levels in society and about doing what we can at the local level. This is also why I try to keep my family’s high-mileage vehicles on the road as long as I can. It’s not just about being cheap and achieving the best capabilities on a budget, but because I take pride in what I do with my hands and applying personal attention and care to things that are important to the people I love. At The Art of Diesel, we hope you had a wonderful Christmas and that you have a Blessed New Year!